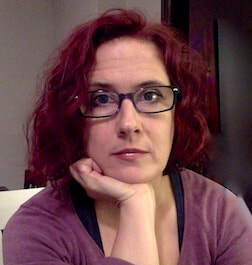 Dana Luciano is Associate Professor in the departments of English and Women's & Gender Studies at Rutgers University, where she teaches queer studies, 19th century US literatures, and environmental humanities. From 2004-2018 she taught in the English Department and the Women's and Gender Studies Program at Georgetown University. She received her PhD in English, with certificates in Women's Studies and LGBT Studies, from Cornell University. Luciano is the author of Arranging Grief: Sacred Time and the Body in Nineteenth-Century America (NYU, 2007), which won the Modern Language Association’s First Book Prize in 2008. Her edited volumes include “Queer Inhumanisms," a special issue of GLQ: The Journal of Gay and Lesbian Studies, co-edited with Mel Y. Chen (vol. 22 no. 2-3, spring/summer 2015) and Unsettled States: Nineteenth-Century American Literary Studies (NYU Press, 2014), co-edited with Ivy G. Wilson. Recent essays have appeared in American Literature, GLQ, J19: The Journal of Nineteenth-Century Americanists, American Literary History, and elsewhere. Luciano is currently at work on two book projects. How the Earth Feels: Geological Fantasy in the Nineteenth-Century US explores the emphasis given to sensory and affective modes of contact with the earth and its deep past in writing and photographs by 19th century US Americans. Employing a geological lens, How the Earth Feels moves beyond considerations of the organic environments often evoked in “nature writing.” It focuses on reckonings with the sensory, emotional, cognitive and agential capacities of the earth’s inorganic elements, rock and water, and on the emotional, corporeal and intellectual effect of those reckonings on its human inhabitants. Time and Again: The Affective Circuits of Spirit Photography is a work of media archaeology using the case of spirit photography—images produced between the 1860s and 1920s by members of the Anglo-American Modern Spiritualist movement, which claimed to provide visual verification of posthumous existence—to explore the affective inflections that inhabit the photographic image: the optimism which infused 19th century thinking about the possibilities animated by the new technology of photography; the melancholy which suffused twentieth-century engagements with the “embalmed” time of the photograph; and the uncertainty which accompanied the late 20th/early 21st century digital turn. From 20106-2018, Luciano co-directed "Approaching the Anthropocene: Global Culture and Planetary Change," a Mellon Sawyer Seminar hosted at Georgetown University. In 2014-15, Luciano was the David R. Atkinson Center for a Sustainable Future Fellow at Cornell University’s Society for the Humanities. She has previously been in residence as an NEH Fellow at the Huntington Library (2012-13) and a Tanner Humanities Center Fellow at the University of Utah (2003-04). Other awards and honors include the MLA's First Book Prize, the Crompton-Noll Award for work in LGBT studies, and the Distinguished Achievement in Research Award from Georgetown University. Luciano is a member of the Editorial Collective for Resilience: A Journal of the Environmental Humanities.